At The Balance Centre, we offer specialist Vestibular Rehabilitation treatment to help those suffering from various disorders associated with dizziness and balance. Vestibular rehabilitation is a specialized form of physiotherapy that involves treatment manoeuvres and exercise in order to decrease dizziness and improve balance. The goal of vestibular rehabilitation is to retrain the vestibular system and the brain to recognize and process signals about movement and spatial orientation in coordination with information from vision and proprioception. 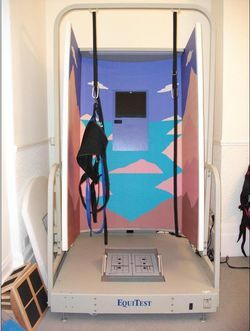 Our vestibular rehabilitation programme consists of an initial evaluation which lasts between an hour and an hour and a half. During this time a series of tests and eye movements are recorded in order to make a diagnosis. Dynamic visual acuity is tested to give insight into vestibular function. Computerized dynamic posturography is used to allow us to measure various aspects of your balance. All the information is gathered to allow us to formulate an individualized exercise programme for each patient. In accordance with our commitment to providing progressive and effective treatments for dizziness and balance problems, our vestibular rehabilitation programme utilises the most up to date knowledge and technology providing our patients with highest level of treatment possible.